Once upon a time I used to make slow cooker carnitas, but have since updated this recipe and moved on to these easy Instant Pot carnitas! Because, duh! They take a fraction of the time and taste just as delicious. So, today I am showing you how to make Instant Pot shredded pork. What do you get when you play tug-of-war with a pig? Ha. That’s a good one, right? I thought it fitting for Instant Pot carnitas. Truly, these are the most and easy Instant Pot carnitas in the world. I have made these over ten times, and have since perfected the recipe. However, they seem to get better and better with each round. The spice blend fills your house with a savory aroma, and the meat comes out tender, juicy and perfectly flavored. It’s hard not to just eat the meat straight from the Instant Pot—it practically melts in your mouth! I’ve also been that obnoxious person in the house who insists everyone needs to eat the stuff. “Come on, just one more bite. One more!” You know the type. I’m like your Great Aunt Mildred who won’t stop pinching your cheeks and who demands you eat seconds. Make sure it has a good spice rub. Don’t cook in too much liquid, and make sure it is slightly elevated out of the liquid. A good rule of thumb for cooking pork in the Instant Pot is 25 minutes manual high pressure per pound. You must cook this pork shoulder for at least 1 hour (60 minutes) on manual high pressure to get it to shred easily. If you cut it into small cubes first, it can cook for 60 minutes. If you cut it in two, it will need 75 minutes on manual high pressure. If you like your shredded pork crispy, arrange it on a baking sheet, drizzle with some of the liquid, and broil for 5-10 minutes until crispy. These Instant Pot carnitas take under two hours to make. You don’t have to devote your entire day to it, and the prep time for all of the other fixings is quick, too. Definitely add this one to your weekly dinner rotation, and grab the slow cooker carnitas recipe below! 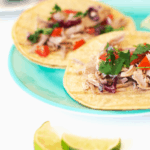 You must make these delicious and easy Instant Pot carnitas. 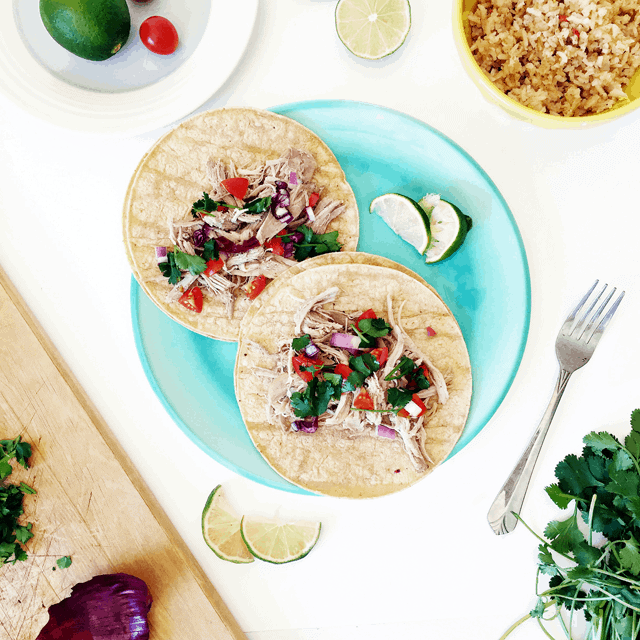 This recipe shows you how to make Instant Pot shredded pork, which is perfect for tacos, carnitas, salads and more. This carnitas meat freezes well, too! In a medium-sized bowl, mix together the garlic powder, salt, cumin and cinnamon. Take your thawed pork shoulder, cut it in two, and coat it with the spice mixture on both sides. Place the 2 basil leaves at the bottom of the Instant Pot and add in the separated pork shoulders. Pour in the chicken broth carefully on the sides, as to not wash off the spices. Sprinkle the brown sugar on top. Close the lid, flip steam valve to "Sealing" and cook on manual high pressure for 75 minutes, natural release for 15 minutes. While meat is cooking, fry corn tortillas in a small amount of avocado oil on each side, until pliable and warm. Cover with foil to keep warm and set aside. Dice your tomatoes and onions and mince the cilantro. Set aside. Flip steam valve to "Venting" and open lid. It is ready when it is tender and can be pulled apart with a fork. Once the meat is done, place it on a cookie sheet and shred using two forks to pull apart the meat. Grab your tortillas and load up each one with a generous portion of meat. Top it off with the chopped tomatoes, onions, and cilantro. 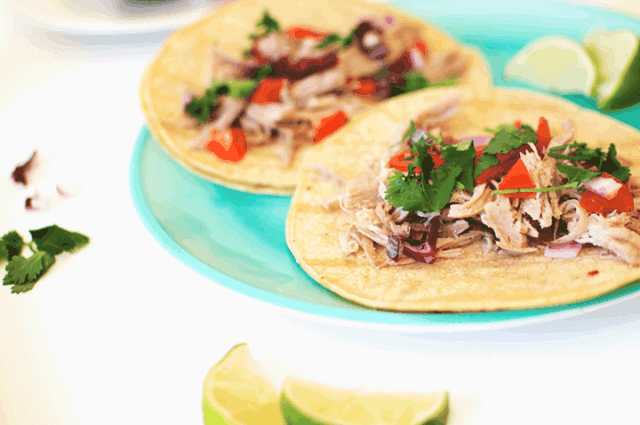 Add any sauces desired, a squeeze of lime, and enjoy your tasty Instant Pot carnitas! New to using your Instant Pot? 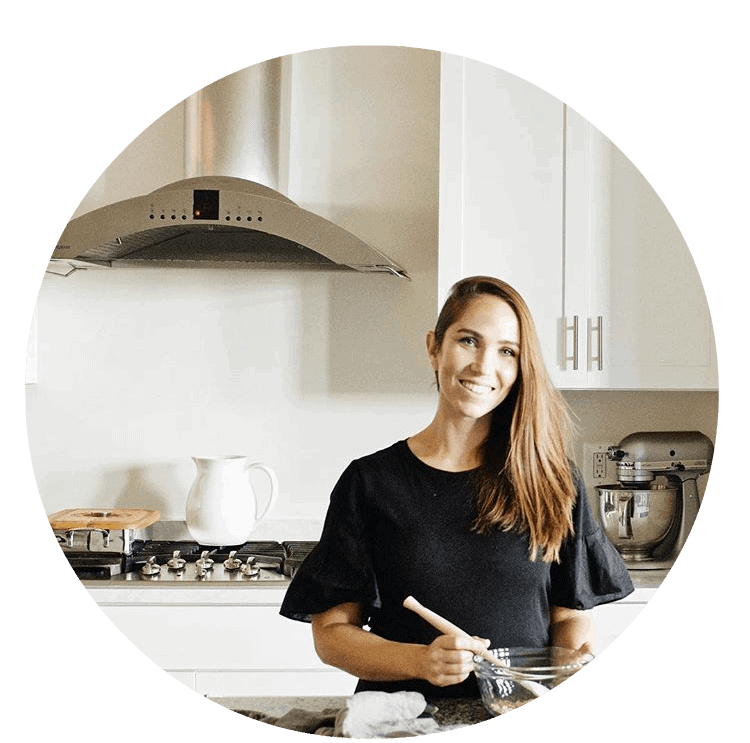 CLICK HERE to sign up for my FREE Instant Pot Starter Kit, where I give you the basics on how it works, how to set it up, along with some beginner recipes. This shows to yield 12 servings but the recipe lists a 1 lb pork shoulder. Is tnat a misprint? Should it be a slightly bigger pork shoulder? Ahh, yes! It’s supposed to say 1 pork shoulder, which is typically between 4-6 lbs at the grocery store. It serves 10-12 when assembling carnitas. Thanks for catching that! Excited for you new blog! I am so excited for you new blog! it all looks amazing!